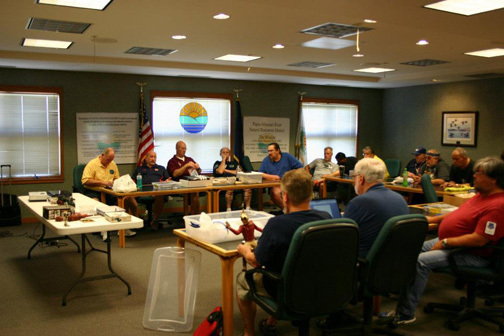 Don reviewed the timeline for the meetings with the membership. Club t-shirt order forms will be available at the April Meeting and on-line on the Fort Crook Web site. A member survey was distributed and 30 were returned. The results of the survey will be discussed at the Business meeting and shown to club members at the April meeting. Winston thanked members of the club and announced he will be leaving in late April for Quantico, Virginia to teach Marines his Air Force specialty. Winston will be missed. The evening programs started with a seminar on building “The General” a Western Atlantic Railroad #3 4-4-0 Steam Locomotive by Paul Haug. Paul discussed the building of his incredibly detailed model consisting of over a 1,000 pieces. Great Job!!! Following Paul’s presentation Jay Chladek gave an informative presentation on the evolution of the Supermarine Spitfire from Mk.I through Mk.IX. Business meeting cancelled for 02/21. Rescheduled for 02/28. Get name tag requests to Randy, IPMS number, member since date. “How-to” links now on the web site. Kevin has entire room for modelers at OSFest. KAG (Klingon Assault Group) at OSFest. Ugliest Enterprise contest. Display space for club. Regular contest. Jay Chladek and Brian Smith on lighting your models. Work-in-progress can either be at the member’s seat or at front – members acknowledge and visit at break. Incorporation at the business meeting next week. Dave Wilson Lawyer will be at the meeting to discuss the pros and cons of the chapter incorporating. Dues idea – Use dues (2013) money to supplement the raffle. Hold over until next meeting. Float the idea of, if a modeler buys a model, then would be reimbursed. Jay is compiling a list of current kits. Poll of preferred kits. Possibly discuss at the business meeting. Old Business: Website will be presented at business meeting on 28 JUN 2012. Go live as early as 01 JUL. Everyone is invited to attend at the Papillion Public Library at 1900. New Business: The annual club picnic will be held at Scott’s house at 1830 on 20 JULY. (details listed on the members page) The club voted to pay for a night’s boarding for the Hackney Hounds as Aubie is getting elderly (come to think of it, so is Auburn) and we don’t want to stress him out. Of course Scott is also getting there, and he may want to spend a stress relief night with Aubie. In order to lighten the load on Scott (and Randy), pulled pork will be ordered (tentatively from “We’ll Smoke U” in Gretna) and everyone should bring a side dish. The club will provide drinks. Don Joy mentioned that the small ceramic magnets are available at the Dragons Lair Comics located at 5322 South 153rd Street (near 153rd and Q in Bag ‘N Save lot). Mike German has been doing a great job taking pictures at the meetings and was recognized by President Mike Whye. The proposed constitution was presented. Bill Whipple noted some minor changes that were included since the mailing to members, i.e. web-site name corrected (Article 5, Section 1c); additional verbiage related to nomination, and election, of a party to honorary or life membership (Article 3, Section 1b and 1c). Motion by Randy Fields, second by Mike German to accept the constitution as presented. Approved by acclamation, no dissenting votes. 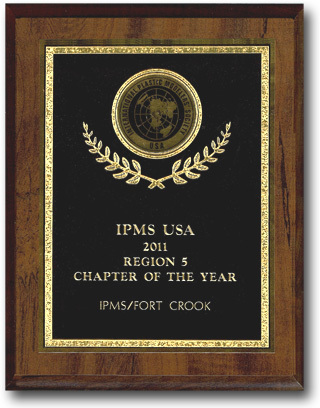 Name will be “Fort Crook Chapter, IPMS/USA”. Randy Fields will follow up with an attorney on incorporation as a LLC (Limited Liability Corporation). Work in Progress: Several projects on board The drawing winner was Don Johnston. Display Models: Several models on display. Tom Long brought several SciFi models he acquired Wonderfest. Presentation: Scott Walsh gave an excellent presentation on buying and selling on the Internet. Highlights included: get Priority Mail Boxes for Free from USPS; overseas under 4 lbs. go 1st class – make your own box; 4lbs or 36” (l x w x h) must go priority mail; be careful of any overseas destination; especially Italy and Russia; need to use customs label for overseas – two forms that break on 4 lbs. ; use EBay overseas. Picnic: A reminder of the annual club picnic was annouced and everyone was encouraged to RSVP with Bill Whipple. Also attendees wrere encouraged to bring side dishes or a dessert. OmaCon: Scott Hackney annouced that the Regional was awarded to Mad City in Madison, WI for 19 MAR 2013. A lengthy discussion on contest dates and spring vs. fall contest in 2013. A spring contest could be held on April 4th or May 18th; the former was not an option because it is one week prior to the Des Moines contest and the latter which could be adversely affected by graduations and Wonderfest. A motion by Don Joy to skip the contest for2013 was put forth and seconded. The motion was carried by acclamation. OmaCon 2014 – Date would be 29 MAR 2014, and it would be a straight OmaCon, no regional with a location to be determined. The Mid America center in Council Bluffs is no longer available since their fee was increased to $2,800 for the day. The Embassy Suites location is available and other locations will be researched to see if we can lower our facility rental costs. OSFest: Kevin Carroll andd Tom Long reviewed the club's participation in OSFest. The contest was discussed and two categories were established "vehicle and feet”. Awards for adults and juveniles (1st, 2nd, 3rd – twelve total; Don Joy to produce and deliver). Convention dates on July 27-29 at the Ramada Inn, 72nd and Grover. Admission will be through “Klingon” security. Saturday there will be a Make-N-Take and it was annouced that Saturday evening Kevin and Julie will become husband and wife during a Klingon ceremony held at the Ramada during the convention. Show and Tell: Several good examples of in-progress models especially Steve Ringlein's 1/35th scale locomotive. Randy Fields gave a presentation on the new Fort Crook website; explaining the different sections, security for club member log-in and ways for submitting information. The URL is - fortcrookipms.com It can also can be accessed using .org or .info. the July Club Contest sponsored by Kevin Carroll was very well supported with two tables of well-built and creative models. Hey, the last club meeting was great! About 30 folks were there. More display models were on the tables than works-in-progress but that's fine please keep bringing them! Scott Hackney filled us in on what's coming up for future Nationals, primarily that Hampton Roads, Virginia will host the gathering in 2014. He pointed out that some vendors were upset with the show in Orlando because the presence of Disney took away lots of $$$ from potential buyers plus there were issues about workers being required to transfer goods between the loading docks and the display floors, cutting into the vendors' profits. I'd be upset too. Hey, the plaque announcing our chapter as the Region 5 Chapter of the Year for 2011 arrived! It is posted on the home page of our website. Now, does anyone have an idea where we should keep it or display it? Marv Howell gave a good talk about the early years of IPMS, how it formed and then its executive board floated around over the years, ending up for a time in Lincoln. He also talked about how the Ft. Crook chapter formed out of two chapters, including one called the Curtis E. LeMay Chapter. Fred Hall, past president of IPMS and from Lincoln, accompanied Marv and added some good points for us to know. ver the years when it was just a handful of modelers. Neil Bable was to then go on deck for his talk about 1/144 airliners (and the ones he had on the table looked NICE) but time was tight. So he's agreed to be our November speaker. Therefore, Don Joy stepped up to the plate and talked about how to log into the new website's forum page and post pictures. Some technical difficulties were encountered and Don said he'd email us the instructions. So what does the future hold in store for Fort Crook members? AUGUST 23rd: Our business meeting opens at 7 p.m. at the Sump Public Library in beautiful downtown Papillion. That's this coming Thursday evening. If you want to help guide our club in what's going on, please show up and speak your mind. SEPTEMBER 1st: We've been invited by the Great Plains Wing of the Commemorative Air Force to be on hand during its annual air show/fly-in breakfast at the Council Bluffs Airport that day, from 8 a.m. until noon. They'd like to have us set up some tables to display our wares inside a hangar. Because it is a fly-in breakfast, breakfast will obviously be on hand. For those who haven't been to a fly-in breakfast called that because pilots from all around like to fly to an airfield for these things plus people who like to see the aircraft. It's usually pretty simple, pancakes, syrup, sausages and OJ, tea or coffee for a low fee. The head of the Great Plains Wing, Jeff Hutchinson, said the P-51 Gunfighter will be on hand plus a T-6 Texan. Some other warbirds should be there; a P-51 is at Lincoln and another at Atlantic, both short hops away. Expect some light civilian aircraft to be there too. So head east on I-80 to Exit 8 on the east side of Council Bluffs and go east on U.S. 6 from the exit until you see the signs at Eastern Hills Dr. (on the south side of US 6 about a mile east of the I-80 exit) turn right and head a bit more than a mile south. You'll see the airport and the first hangar is the CAF's home. Because the CAF is out of tables, we're bringing our own. Kevin Carroll said he has some and Bill Whipple has agreed to pick those up and bring them to the airport. If you have fold-up chairs, it might be wise to bring them. Bring some models, wear your shirts and nametags, make some friends and maybe invite someone to our meetings! I hope to see you there. Let's show the flag!!! SEPTEMBER 19: Our next club meeting. Carl Musselman is our entertainer that evening with the wonderful images he shot at the recent Nationals in Orlando!!!!! SEPTEMBER 22. Of course no one says they want to go to Leavenworth...you know, the big federal penitentiary, but Prison City Modelers IPMS club is hosting its annual contest this day at The Heritage Center in downtown Leavenworth. It starts at 9 a.m. with judging starts at noon and the prizes are awarded at 3 p.m. It's about a 3-hour drive from the Council Bluffs-Omaha metro area. Steve Ringlein's already going with a car full of guys so if other members would like to go, think about forming a caravan with Steve and traveling to KC. If you want contact Steve you can reach him at Sringlein@cox.net. I wish I could go but can't as I'm out of town again, this time way down in Alabama (dang). But note that the U.S. Army post is just outside the city and if you bring picture IDs, you can get in the gates and visit the post museum. There's a lot of neat stuff to see there. For future reference: September 29th is Nordic-Con in Plymouth, Minnesota...near the Twin Cities; and on November 3rd, KC-Con is held in Kansas City. 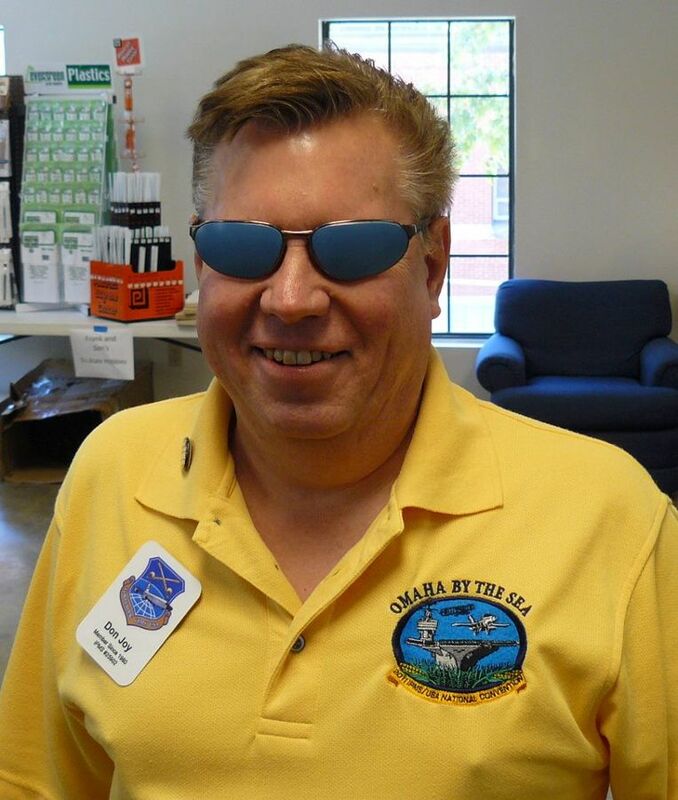 Carl will do a convention report at the September meeting. Scott offered some comments on the convention in general, i.e. union problems, tables to small, etc. Colorado’s website will be up and running in mid-September. Mike talked to Jeff Hutchinson (commander of CAF Wing at CB). Would like Ft. Crook to set up tables at the show (fly-in) on September 1st from 0800 to 1200. Bill Whipple has three and transportation. Other table “owners” should notify Bill or Mike on availability See notes above. September is “Multi-Engine”, sponsored by Brian Smith. The contest theme is Multiple Engines so if what you're modeling has more than one engine (twin intakes with one engine such as an F-104 don't count!) it's in the running. The Titanic with all those big brass props, a P-38, a PT-boat, a twin-engine Huey, a B-52 or a twin-engine dragster qualifies for the contest. Support Brian’s contest and bring them in. Don and Randy discussed how to access and add pictures to the forum. Don will be sending out detailed instructions on how to post to the forum. Excellent presentation, with comments by Fred Hall, on the early days of IPMS/USA from its birth (split from IPMS/UK) up to a few years ago. by Carl Musselman at the Prison City Modeler's Contest held in Leavenworth KS. Announcement of the proposed amendments to the constitution. Vote in October. October meeting event: “Clean out the Closet” annual kit auction. Up to five lots (as many kits as desired in a lot). Bids will start at .50 raises up to $10.00 then $1.00 raises until sold. Reminder of the Leavenworth, Kansas Prison City Modelers annual contest held on November 3rd. Kevin Carroll– Thanks for the club picnic; had a great time. Currently going through 12 boxes of a model “donation”. Thanks to Don for his assistance at OSFest. Kevin Stone – George Lucas American Graffiti movie event Nov 02 at the Joslyn Art Museum. Members are encouraged to bring plastic or die cast models. Let Kevin know if you are planning to attend to receive free admission. Paul Haug presented a Free pass to the SAC Museum – John Lanning accepted. Don covered how to get photos on the website. Put pictures on Photobucket (http://photobucket.com/) / Facebook (https://www.facebook.com/) / etc. 525 pixels or less for width. May be treated as spam if load get too big; if so, reduce number of photos until accepted. Shoot questions to Don (donjoyjr@cox.net). Discussion on Constitution and amendments. Randy Fields presented the new Articles of Incorporation and By-Laws which are designed to replace the Constitution and By-Laws presently in place. The new documents will bring the club in-line with existing Nebraska and Federal laws regarding corporations. Bill Whipple will perform a cursory review and suggest desired modifications. A copy will be emailed to all members for review and any other suggested modifications. Election will take place at the November regular meeting. Kevin Carroll– Mentioned there will be a party for kids on Sunday,27 October at the SAC Museum from 0900 to1500. Kevin Stone – Mentioned the George Lucas American Graffiti movie event on November 02 with an 1800 set-up and 1900 start. Will be at the Joslyn Art Museum. Members are encouraged to bring plastic or die cast models. Let Kevin know if you are planning to attend to receive free admission. KC Con Nov 03rd – Model run to Sprue Brothers – notify Scott if interested in the visit to Sprue Brothers. A very exciting auction took place with auctioneers Mike Whye, Brian Smith and Randy Fields handling the bidding process. Many great kits, magazines and decals were put on the auction block and sold. Don joy stated the auction resulted in 92 transactions.